Congratulations to Jon Porter who received the 2010 RPFANS Achievement Award. 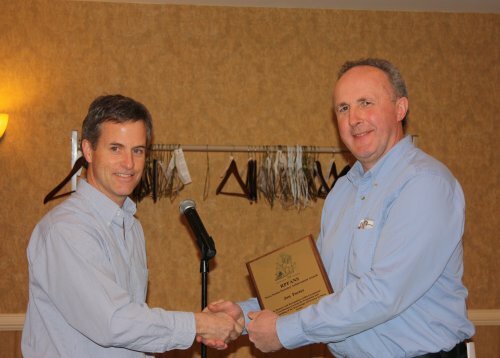 Jon received this award "in honour and recognition of his exceptional contribution towards the promotion and understanding of the knowledge of forestry in Nova Scotia." This was in relation to his work on the Natural Resources Strategy, Forests Panel of Expertise, and for publishing a report entitled, "The Roots of Sustainable Prosperity of Nova Scotia." His dedication to writing this report shows a commitment to continued forestry education and a professional approach to improving forest policy to balance social and environmental values. As a Registered Professional Forester in Nova Scotia, he has rendered distinguished service to forestry through development and dissemination of forestry information for the benefit of society and has highlighted the importance of forestry awareness for many Nova Scotians.